The Crab Nebula (catalogue designations M1, NGC 1952, Taurus A) is a supernova remnant and 'pulsar wind nebula' in the constellation of Taurus. The nebula was observed by John Bevis in 1731; it corresponds to a bright supernova recorded by Chinese and Islamic astronomers in 1054. In 1840, astronomer William Parsons gave it the name it has today. The nebula is about 6,500 light-years (2 kpc) from Earth. It has a diameter of 11 ly (3.4 pc) and expands at a rate of about 1,500 kilometers per second. It is part of the Perseus Arm of the Milky Way Galaxy. ↑ 1.0 1.1 1.2 "M 1". SIMBAD. Centre de données astronomiques de Strasbourg. Retrieved 12 February 2012. ↑ Kaplan, David L.; Chatterjee, S.; Gaensler, B. M.; Anderson, J. (2008). "A Precise Proper Motion for the Crab Pulsar, and the Difficulty of Testing Spin-Kick Alignment for Young Neutron Stars". The Astrophysical Journal 677 (2): 1201–1215. doi:10.1086/529026. ↑ Hester, J. J. (2008). "The Crab Nebula: An Astrophysical Chimera". Annual Review of Astronomy and Astrophysics 46: 127–155. doi:10.1146/annurev.astro.45.051806.110608. ↑ Parsons, William (1844). "Observations on Some of the Nebulae". Philosophical Transactions of the Royal Society of London 134: fig. 81, plate xviii, p. 321. doi:10.1098/rstl.1844.0012. https://archive.org/stream/jstor-108366/108366#page/n5/mode/2up. ↑ "Crab Nebula: the spirit of Halloween lives on as a dead star creates celestial havoc". ↑ 7.0 7.1 7.2 Mayall N.U. (1939). 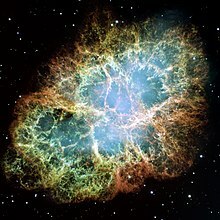 "The Crab Nebula, a probable supernova". Astronomical Society of the Pacific Leaflets 3: 145. ↑ Glyn Jones, K. (1976). "The search for the nebulae". Journal of the History of Astronomy 7: 67. ↑ Lundmark, K. (1921). "Suspected new stars recorded in old chronicles and among recent Meridian observations". Publications of the Astronomical Society of the Pacific 33: 225. doi:10.1086/123101. ↑ Collins, George W., II; Claspy, William P.; Martin, John C. (1999). "A reinterpretation of historical references to the supernova of A.D. 1054". Publications of the Astronomical Society of the Pacific 111 (761): 871–880. doi:10.1086/316401. This page was last changed on 24 January 2019, at 12:31.